As you should all know by now ALL cadets must Pass the PRT twice a year, hand in course work, and attend a minimum of one training per year and maintain an attendance of 80%+ to stay in the program. With that being said, the PRT is this month, you must be at drill and pass the PRT to attend any training’s and stay in the program. I have already started cutting orders for training’s and the Buffalo Training is live, I will not hold spots so if you want to attend you are to email LT Melanie Pawli with the training code & dates of the training you want to attend. DO NOT GO THROUGH YOUR CHAIN – YOU COULD MISS OUT ON A TRAINING BY DOING SO! For all Parents who have NOT sent their child to a training I strongly encourage you to attend the parent meeting on Sunday April 14th at 2:30 pm at the Buffalo NOSC. At that time, I will go over what you need to do as a parent to ensure a successful training for your child. 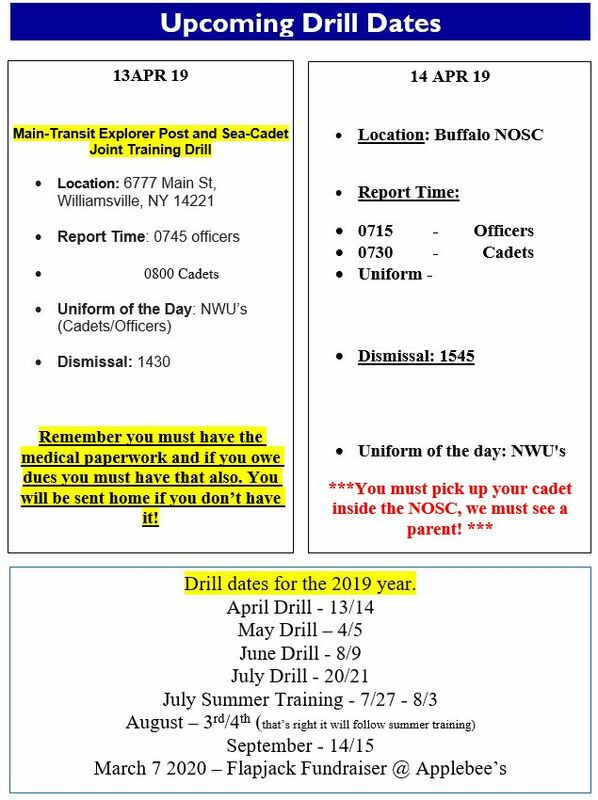 Any child that was given an envelope from LT Melanie Pawli at last drill; containing required medical information for their records, all information is required to be handed back in by Saturday of April drill. NO EXCEPTIONS!!! All this information is far overdue. If you do not have this, you will be sent home as we can not have a child that has no current medical information on file and they must be current in their dues to participate. Shooting will be on Thursday, 18 APR 19, at 1900. 10 cadets are needed. Cost is $11.00; please bring exact change. See the ENS Simone at drill if you want to sign up. Must be 12 or older to attend shooting. If your child has a physical coming up please make sure you have the doctor fill out a new Medical Exam & Supplemental form. We must have a current form on file for your child to be in the program.